Activities that initiate and sustain energy reduction are an important part of efargo’s community focused plan. Within the activities dashboard, you can learn about our urban game, sign-up to play, check out recent events, learn from our planned demonstration house, and check out our top ten energy saving actions to implement in your home. Our spring semester has come to an end, but that doesn't mean we're done just yet. Stay tuned as we begin to build next fall! After many weeks of hard work and determination we have reached the end of the semester with completed construction documents in hand! This week being our final week of the spring semester, we gave it one last push with our construction documents, wrapping up the design phase, and beginning to gear up for the build this coming fall. A project like this only comes once in a lifetime, and we are all so grateful to have had the opportunity to be a part of it. Together as a team we have faced many challenges and hurdles along the way, but in the end we have learned more than we ever had before. In a rather short time frame, we have become experts on passive house principles, gained experience with city planning and re-zoning, increased our confidence with residential building construction, have become aware of what it’s like to design on a budget, and most importantly learned how to collaborate as a team. This has truly been a semester which we all will never forget! Be sure to keep an eye out for new blog posts and pictures coming this fall as we document the build of the proposed design! Putting together the final touches on the houses and making the construction sets perfect before submitting. Over the course of the week, the team has put together all the small details. As we near the end of our time in the design portion of design build, it is up to us to make sure everything we want is reflected in the plans. Dylan and Gretta have put together the final details behind the finishes in the interior and exterior of the house. This involves the gazing at tons of lights, cabinets, counter top finishes, exterior materials, and flooring. Through the course of many meetings with local supporters of Habitat, the homes' finishes and final details are finally coming together! Some of the biggest concerns are Low VOC's and saving money along the way. We have found that a little research goes a long way! After our successful Earth Day Event hosted at Ecce Gallery and Barry Hall in downtown Fargo, the Design+Build team switched gears to focusing their efforts on finalizing the construction documents. The Earth Day Event at the Red River Zoo, Ecce Gallery, and Barry Hall showed the Design+Build Team that our design is really picking up traction. Many businesses, community leaders, and common folk have shown a great amount of interest in the work we're doing, including one of the future owners of the coming Passive Houses, whom got her first look at her future home. After such an exciting week, we now switch over to adjusting and red-lining our construction documents, an important book of information to be given to Habitat for Humanity. The documents require a high degree of detail, and it has taken the whole team to tackle completing the set. We did get a chance to present to Urban Learning Circle, a small group of people orchestrated by Joe Burgum. The team assembled for an early-morning presentation, where we first went over the principles of Passive design, and then displayed our designs in both plan and rendering. The Urban Circle also got a chance to see our mock-up wall types, showing physically just how a Passive Wall is put together. Joe and his circle were excited about the prospect, claiming all houses should be built in such a manner. Building methods such as these could be implemented in the future, but traditional methods will be around for quite some time. But perhaps Passive building methods will be implemented sooner, if we can set a great example to the people of Fargo. Energy learning exhibits and construction documents take the focus while we move forward with design development. As the construction document process continues we also had to put some focus into preparing for a presentation that was held on April 23rd at ECCE art gallery located in Downtown Fargo. The purpose of this presentation was to inform the community about energy efficiency in their homes. In order to do that, we constructed three interactive demonstrations that dealt with site orientation, air tightness in buildings, and proper insulation. We also used the opportunity to show the progress we have made on our design and to receive some feedback on what people thought about the project. The event went great and there was an awesome turnout from the community. We want to say thank you to everyone who attended! As far as the construction documents, we are still working on refining all of the details such as wall construction, roof/wall types and corners. These are still being worked out as well as understanding the pluming/HVAC layouts and details of the site plan. Constant red lining of the construction document set highlights the areas that need work and gets us closer to checking off the list of things that need to be completed. There is still a lot that needs to be done as we approach our deadline but we are hard at work and confident in finishing on time. As the work continues, we are lucky to get wonderful feedback from surrounding individuals. As the construction design production for the design build continues, production for publicity for this project is starting to go haywire. Not only are we working on drawings now, we are also outreaching to infinity and beyond to what exactly Passive House is. We held an event at NDSU this last week to spread the word, full of process drawings, models, virtual video footage, Google Cardboard renders, posters, and a few interactive games. These included Putt Putt, a mini golfing game using our 200+ models we constructed earlier in the semester during out Schematic Design phase. The game turned out pretty sweet. It seems every time we present to the client, random guests that walk by, and/or many other people we always get advice to make this project better and better. Thank you! A week of hard work paid off with presentations to the NDSU Alumni Board, Dan Rockhill, and other guests in Renaissance Hall. This week culminated in an all day Passive Learn and Play event on Friday consisting of presentations, education, fundraising, games, and cookies all related to our Design/Build studio. Located in Renaissance Hall, we were able to pack the first floor lobby with Design/Build work. Scores of models and drawings showcased our iterative design process, while renderings, final models, a walk-through video, and virtual reality through Google Cardboard presented our final design. During open house hours, we invited attendees to play mini-golf, navigating through our process models to reach the goal. Additionally, people had the opportunity to sponsor the project through the purchase of custom T-shirts, mugs, cookies, or any of the aspects of the Passive House that still require funding, such as solar panels, trees, or a shading device. The open house was punctuated by presentations to the NDSU Alumni Board and guest speaker, Dan Rockhill. Despite a full day of meetings, the Alumni Board was very attentive and receptive to the project, offering support following the presentation. Dan Rockhill, of Studio 804 in Kansas, was able to bestow knowledge and wisdom from years of Design/Build experience, engaging our studio in conversations regarding everything from design agenda to foundation details. Inevitably, the event encountered surprises, from an eager group of home-school students touring the building to a delay in Dan Rockhill's flight, but the Passive Learn and Play was a great success. We appreciate everyone who joined us for the event! Work on the Design Development drawings continued and intensified this week as we worked toward submitting the drawing set. The Design Development drawing set requires increased detail in order to be priced by our contractor. Through multiple sets of corrections and red-lines, the project has become more and more refined, turning into a clear set, including a site plan, framing plan, floor plans, wall sections, and elevations. As we move forward, we will continue to work on energy modeling, refining details, and materials and product specification. As part of the Design Development process, we all came together to create the large list of drawings that be needed to make a final drawing set. Many of these drawings will be pulled into final construction document drawings. It is very exciting to witness the hard work transform into a more finalized project. The details of this project are becoming fully realized to fit the Habitat goals and cater to the City of Fargo. After spending so much time becoming accustomed to the passive house standards we've all become fascinated with the fine details that make it work. Wall details and materials are a bigger part of the process currently, with an emphasis on build-ability. Many of the design decisions are center on making this project a feasible volunteer opportunity. We are also working hard to accomplish Passive House certification through energy modeling. The design build studio is analyzing solar panels and window placements to ensure a healthy thermal environment for the future occupants.Providing the proper thermal barrier in our cold Fargo climate is a challenge, but we have come up with unique solutions to wall and roof constructions. On April 8th we will present to the NDSU Alumni Board on the status of our project. We invite anyone interested to come and see what's brewing at NDSU's Architecture Program! Following Spring Break, our studio has moved into Design Development and is preparing for upcoming presentations and exhibitions to show our progress. The week of the 21st was a very big week for our studio. After returning from Spring Break, we came together to organize the coming weeks as we shifted from schematic design to design development, and approached our big fundraising day. Tasks on our work list ranged from foundation design to selecting plumbing fixtures, giving everyone an opportunity to work together and work on tasks throughout each aspect of the building design process. On April 8th, the board of alumni visits the school for the annual Beaux Arts Gala. Their day is full of meetings and presentations on the current happenings at NDSU, and our Design+Build studio has been given a great opportunity to show them everything we’re capable of. Their visit along with the Beaux Arts Gala later that night mean heavy traffic in Renaissance Hall, so we’re preparing exhibits and activities to educate visitors and other students in the building on our process, Passive House, and on working with Habitat for Humanity. We also resubmitted our PUD application. After the first submission, we realized by rearranging a few elements we were able to create a more even, more generous floor plan for each of the homes in both phases of the project. After submitting the PUD and PLAT we are now moving into the Design Development stages of the project where we will continue our detailing with a single design. This week we submitted the necessary documents to continue with the project. This was a huge milestone for the project as we now move from the Schematic Design phase to the Design Development stage. After these documents are finalized our building footprints, setbacks and density are all locked into place. Over Spring Break we broke into a program called WUFI Passive. This is a energy modeling software and can be found here. This program goes in deep with highly inclusive data input to give us results on how we are doing in our pursuit of reaching the goal of the first Passive Certified house in North Dakota. Over the coming weeks we have a lot to finalize from intricate details, to facade types, to foundation placements. We are in the thick of this design and we as a class are pushing forward to make this build a reality. Cable... That works good for pulling down old rickety barns! Had to get rid of those pesky power lines. Yep... a gun would work! Glory shot of that beautiful barn wood! Man that was a lot of wood! Man that's a lot of nails! Ian going hard on those window details! Yeah! I think we accumulated a little too much stuff... We are not horders! Working hard for the final push! This printer is so dang slow!!! Man... We have a lot of samples of stuff! Trying to go through everything! View from the drivers seat. Love that screen glare! Cookies, Giving tree/truss, T-shirts, mugs. What more could you need!? Bertolini pulling out his dance moves! dB presenting to the NDSU Alumni Board. You got this Gretta! Nick is just being a stud... That's all I have to say. Mix together time, context and brilliant minds. And you get this! Professor Malini's first look though the virtual reality goggles! Josh Cranking out the mini put, put course! A little bit of flashing makes everything better :) So do cookies. Cutting diagonally across corrugated steel is harder than you'd think! Sneak peak of the put-put course going to be at our April 8th event! Trying to pull of the old tape here we go! Still peeling off the old tape... Man that sucked. 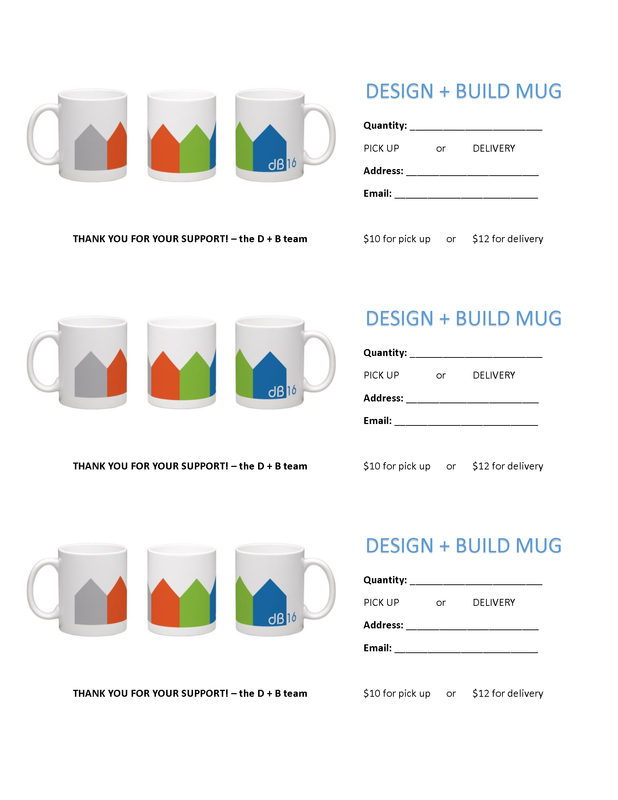 That Design Build 2016 Mug though! Checking out a sweet fold-able foldable pamphlet idea! Oh my... is that the evil Dr. Wastawatt I see on that screen! Get him! Hmmmm... What are we looking at? I don't know either. Is that Stanley our conveniently placed cutout friend? Yep... We're thinkin' about something. Ya know... There are perks to spending every waking hour in studio. There must be something important about that. Alright! Doing work at the site! Go Ian! Don't disturb the Dylan... He seems really focused. If you are looking for something you lost. Look under a piece of paper. Yeeeaaaah, we made a few models. Look here to see what Design Build 2016 is up to. This Blog will keep you up to date with how the project is coming along! With the generous support of donors and volunteers LAHFH has made a lasting and meaningful impact in our community by helping local families realize their dreams of home-ownership and furthering Habitat’s goal of simple, decent and affordable housing. Habitat for Humanity (Name) has an open-door policy: All who believe that everyone needs a decent, affordable place to live are welcome to help with the work, regardless of race, religion, age, gender, political views or any of the other distinctions that too often divide people. In short, Habitat welcomes volunteers and supporters from all backgrounds and also serves people in need of decent housing regardless of race or religion. As a matter of policy, Habitat for Humanity International and its affiliated organizations do not proselytize. This means that Habitat will not offer assistance on the expressed or implied condition that people must either adhere to or convert to a particular faith, or listen and respond to messaging designed to induce conversion to a particular faith. Orders have now been taken, so get excited for your DB Gear! Because of the efficiency of these buildings it is very easy to use renewable energy sources in small quantities to create a Net Zero home if not a Net Positive Home. Because of the way these buildings are constructed there is little heat loss and any change in temperature outside or inside can quickly be handled by the mechanical systems. These air systems typically are a continuous ventilation system which means that the system doesn't turn on and off. Instead it continually circulates air and uses other systems like a heat exchange in order to make a very efficient system. Since Passive Buildings are more of a performance based set of criteria there is no specific requirement for any building typology making it possible for a great variety of projects. "Passive building cuts energy consumption by 60-80 percent compared to code buildings. Certified passive buildings provide superior comfort, indoor air quality, and resilience." This is the Passive House interactive Dashboard! Above is a series of different buttons that help to understand the different components that make a Passive House a passive house. Click around and discover what this building is really made of! -Dark casing enclosing tubes of the water itself or chemicals are heated by the sun and can be used as domestic hot water in a house. Thermal bridging occurs when an area of the building envelope has higher heat transfer than other areas. This tape seemed to work a bit better. How do we get a covered carport to not be so dark and enclosed? How do we resolve the details? What happens when shared Revit file across all our computers gets messed up. Full scale mock ups? I think yes! After all that tape we peeled off, we were able to make a soccer ball! Were you excited for Design + Build Gear? Well you should be now because it is now on preorder, click below to get yours! After many, many different iterations, we narrowed down our carport.